Living in the Light of Eternity takes a fresh look at biblical discipleship. Unafraid to ask some tough questions, K.P. Yohannan will challenge you to look beyond temporary concerns of life to what will last forever. 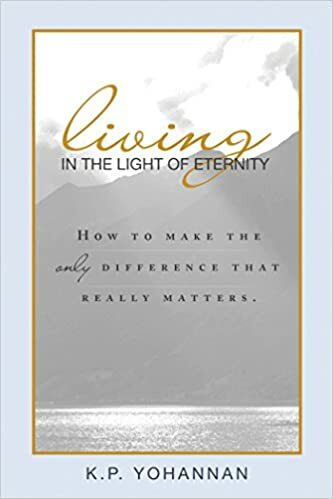 Through the material of this book, you will gain a solid basis for genuine spiritual growth as you learn to organize your priorities in the light of eternity. Jesus did not train His disciples in a classroom; He taught them through example. He lived His life before them and then willingly laid it down. No wonder that, after the disciples were filled with the Holy Spirit, they remembered Jesus’ words to go into all the world and preach the Gospel. And every one of them laid down his life for preaching the Gospel. At one time I thought John was the only disciple who was not martyred. Later I learned that he was beheaded. Another disciple, Thomas, journeyed to India in AD 52, where he preached and laid down his life for Jesus. One of the seven churches he planted is located about three miles from where I was born and reared. Doesn’t it seem strange that these men who walked and lived with Jesus for three years, men who saw miracles almost beyond belief and who must have had great faith, were not supernaturally translated to heaven, but died criminals’ deaths? How could they have traveled to places and done things they knew would put their very lives at risk? Jesus also said, “I tell you the truth, anyone who has faith in me will do what I have been doing. He will do even greater things than these, because I am going to the Father” (John 14:12). I remember studying the book of Acts in Bible college. As we went through it, I thought it was a fascinating piece of history. But it is much more than history. The book of Acts is a living, open-ended book whose story continues even today in the lives of committed believers. It is a book filled with the stories of people who were absolutely sold out, who had only one thing on their minds: Jesus died, He rose again, He is our Lord, He is coming back and we must tell our generation! These believers yielded their lives unselfishly to communicate this message. When they were misunderstood, mistreated, persecuted, stoned and beaten up, they did not go around mourning their losses and licking their wounds. They went right back out and preached the Gospel—and not just the apostles, but the believers, the everyday, “normal” people like you and me. When we read about Jesus’ life and are challenged to follow in His footsteps, we feel overwhelmed. I can’t help it, we rationalize. I’m only a human being. Jesus is God. How can I expect to keep up with Him? And we excuse ourselves from total commitment. Then we come to Paul. It is not easy to write Paul off because he was just as human as we are. “I know that nothing good lives in me, that is, in my sinful nature,” he wrote in Romans 7:18. He considered himself an earthen vessel, a jar of clay (see 2 Corinthians 4:7). Paul recognized that in his own strength he started from zero. He confessed his weaknesses and inadequacies continually. This is a man who argued with Barnabas, his co-worker. Acts 15:39 tells us that “they had such a sharp disagreement that they parted company.” But for this normal human being named Paul, following Jesus was not a nine-to-five job, nor did it have a finishing point. This was everyday life for him. This incident was just one of many for Paul, an everyday occurrence in his Christian walk. He was accused by the crowd of, in the words of the King James Version, having “turned the world upside down.” But to him this was simply part of following Jesus. There was no dichotomy in Paul’s life or in the lives of the early believers. Their lives were not compartmentalized into “spiritual” and “secular” activities. Their whole existence was a solid commitment, a life given for the Lord and His kingdom. Excerpt from Chapter 2 of Living in the Light of Eternity (ISBN 9781595891402) © 2014 by KP Yohannan, the president and founder of Gospel for Asia. This entry was posted in Living in the Light of Eternity and tagged Christian-living, Christianity, Deeper-life, Discipleship, Dr. KP Yohannan, gfa, Gospel for Asia, Jesus, K.P. Yohannan, KP Yohannan, Living in the Light of Eternity, Spirituality on August 26, 2014 by gfaseo.